Do you ask yourself that often enough? We use it as a greeting, probably every day. We need to be checking how we are every now and again, I mean really checking. We get so caught up in every day life, rushing around getting every thing done as quickly as possible. Even when you’re getting things done and you feel on top of everything. I’ve been getting things done recently. I have been bossing the s**t out of every thing! I know what I’m doing, where I’m going and exactly how to get there. Unfortunately I’ve been so hell bent focused on sorting my s**t out that I’ve started to neglect myself. I know what I should be doing for myself. So why aren’t I doing it? It’s because I think I don’t have time. I’m so busy with everything else that I don’t realise that if I don’t take care of myself nothing will ever get done anyway. 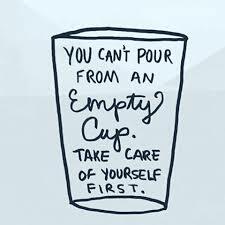 You need to take care of yourself first. It’s not selfish, it’s just natural instinct. The daft thing is that it’s really simple. I have 5 little things that I need to do, that we all need to do really and admittedly I don’t stick to this but I am trying. First thing in a morning drink a big glass of water. Keep a water bottle filled up and keep it with you all day. You have to keep hydrated. If you have a routine that prevents you from eating at ‘normal’ meal times then you should be having healthy snacks, as often as possible. I get terrible headaches if I don’t eat regularly and very, very hangry. Remember when you were little and you had a bedtime routine? Maybe it was to have a bath, a warm drink, story and bed. It was relaxing, calming and soothing. It worked. You should do this for yourself now. We have a rule in our house that at 8 p.m all electronic screens go off. This helps my son relax before bedtime and switches his mind off. The bright lights from PC’s, tablets and phones keep you alert and this makes it difficult to realise when you are tired. Keep your phone away from you in the run up to bedtime. Stick to a bed time and a time to get up. Read a book before bed. Listen to relaxing music. Anything to get you in to a more relaxed state. Get shifting. Walk, run, skip, jump. Exercise is a great way to life your spirits. It improves mood, stamina and concentration. Plus if you go for a walk or a run you get to be outside and you might see some doggies! I understand that this might not be for everyone but don’t knock it until you’ve tried it. I love meditation. It helps me focus and calms me. It also helps me sleep. I use it alongside yoga and I cannot recommend it more. If you’re not at all interested in the practice of yoga then at least give stretching a go. Here’s the meditation routine I’ve been using recently but there are loads of different methods out there. Videos on YouTube and audios on SoundCloud. When I don’t follow a simple health care regime I start to suffer. If I am on an exercise routine for some time and I suddenly stop it takes about a week for my body to start yelling at me that I’m a d**khead. My shoulders start hurting, I get bloated from stress, I get headaches, my skin suffers, I get irritable (more than usual) and I either lose my appetite or crave sugar. It’s not great. Why would I want to make myself feel like this? Especially when I know how easy it is to make myself feel great! I have the drinking water and meditating down already, I just need to sneak in the other three things, get it all in to a routine and voila! Three of the things I’ve listed are things that we do every day anyway, they might just need tweaking in order to make them more beneficial for you. Plus they can all work with each other to make the next one easier to fit in to your life. For example if you get a good nights sleep you’ll feel better the next morning, start that day off with a big glass of water and a bowl of cereal, you’ve already ticked off three of the things already. Grab some fruit or cereal bars to take with you for the day and you’re set for healthy snacks. If you can fit in five minutes worth of meditation before work then that’s great. If not you have the rest of the day to find those five minutes. You can even do it as part of your bedtime routine. For me the exercise part is the hardest to fit in to my day as it obviously takes longer than the rest of these activities. This is where you have to get strict with yourself I’m afraid. If rigorous exercise freaks you out just start with a stroll around the block. It’s a start. Pick three days a week where you can definitely go for a walk. Then stick to it. Make it part of your life. Don’t let it be one those things that you think isn’t important, it is.